With memories of last year's excellent Mousetrap Classic still fresh in my mind, Kris Ericksen and I were looking forward to the 2001 event. The only problem was a Cave Search and Rescue Exercise (SAREX) being held the same weekend. Luckily, though, it was being held at Nettlebed Cave on Mount Arthur, only a short drive from Takaka Hill, and was programmed to finish mid Sunday morning, which would give us time to catch the final day of the Mousetrap. Friday was dull and miserable- no good for flying, but fine for caving. An Iroquois helicopter flew a large aggregation of cavers to a camp site at the Pearce Resurgence, close to Nettlebed entrance, and teams of cavers were despatched to search for supposedly 'lost' cavers, and rescue a caver with a 'broken ankle'. 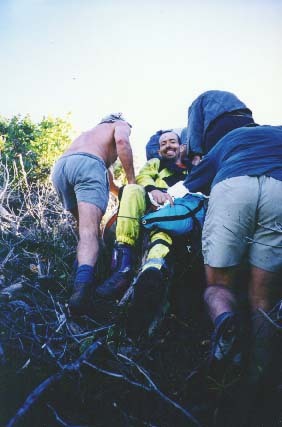 With no sense of impending irony, I helped the team rescue the 'injured' caver. Exiting the cave late on Saturday, the weather was still indifferent, but forecast to improve. At the camp site, a pair of Blue Ducks kept us amused, unconcernedly courting each other within feet of dozens of cavers. The SAREX was cut short late on Saturday night as the Iroquois was required for a real Search & Rescue (to look for a lost tramper on the St James) and Sunday morning arrived early with the whirling blades of the Iroquois, threatening to blow away any tents not packed up yet. 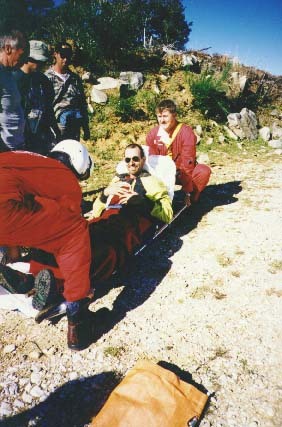 Several helicopter trips later, it was my turn to be evacuated back to base camp, along with Kris. The morning was beautiful- cloudless, warm and still, so Kris and I decided not to wait for the debrief but head up to Takaka Hill. We arrived in time for a coffee at the Jade Cafe with the other pilots. Some had got a flight on the Saturday, but we hadn't missed much flying (much to my somewhat selfish relief). Ashley was hobbling around on his broken leg (after sustaining a fractured hip head during the week of the Nationals in January), and had been flying - something likely to turn his doctors in their graves if they found out! The wind was from the East, so we all went to the Riwaka side of Takaka Hill- a small, knarly take off, due to the pine stumps and rocks scattered around. I entered the 'Drag Race', (once more an undersubscribed activity, with only Kris and I partaking), and flew in a lovely, sparkly knitted dress, with pearls to match. Luckily, this flight went fine, with nice thermals coming up from the Riwaka valley, taking me to 1300m at times. An hour and a half later, I landed, along with a gaggle of other pilots in the valley, and we headed back up the hill, piled in the back of a ute. At the main Takaka Hill take off, the breeze started coming over the back as we arrived- a few people had got off previously, so it was back to the Riwaka take off. Kris got off first (he hadn't managed to take off in the morning), and then I set up and went. At this point my weekend turned to custard. As I took off, the glider overflew a little, causing a slight dive. Not normally a problem and I was still flying, expecting to recover and fly out. The problem was that an old and bitter pine stump, seeing its chance to get even with the humans who'd chopped it down, stuck its curtailed trunk nearly 2 metres in the air from its resting place maybe five metres down the hill from the launch site. I saw the top of the stump aiming directly for my family jewels, and made a snap decision (pardon the pun) to fend it off with my leg, that being the more disposable of my bodyparts. I felt a shap blow to my shin- not painful, suprisingly- and I was spun backwards. My glider dived more, and I was dragging through a forest of fruiting Himalayan Honeysuckle stems, which slowed me down to a stop. My foot wobbled. Oh Shucks! 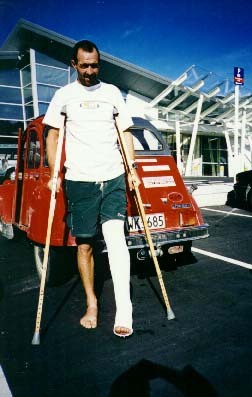 I thought (or something like that), as I knew I'd got a broken tibia. "Are you OK?" came a voice from above. "Yes," I shouted back, then realised that was not strictly true; and added "except for a broken leg". Help arrived with a pilot crashing through the bushes. A look of horror spread across his face. I looked at myself and realised what I looked like. Being a vet, with some knowledge of broken bones, I spotted some sticks, and one kind soul had gaffer tape handy, so I was able to fix a splint, with some assistance. Then, half a dozen pilots managed to slowly lift me up the slope to the take off area in my harness- the only problem being my reserve, which decided to deploy itself on the journey up! Meanwhile Kris was flying out the front without enough height to get back over launch, and without his radio, getting slightly more anxious as time passed and Andy's wing remained motionless in the scrub. Despite my protests, someone called a helicopter. Please don't let it be the same helicopter from the SAREX, I thought- That would be embarrassing! Fortunately it wasn't- a shocking pink chopper arrived instead to take me on my longest cross country flight so far- straight to Nelson Hospital! X-rays revealed a spiral tibial fracture in the lower third of the bone. This has since been pinned, and I'm not allowed to fly (or do much at all!) for three months. I do consider that my boots prevented a worse break though. Proper ankle support probably avoided a compound fracture with all the possible complications of infection. I bought the boots after seeing someone's tibia go right through the side of their ankle joint and (inadequate) boot, after a bad take off. He now has a permanent disability- a heavy price to pay for cutting corners on safety equipment. I would strongly recommend that all pilots invest in good boots that provide ankle support. I'd like to thank everyone present who helped me (I can't remember everyone's name), and apologise for spoiling the afternoon's flying! 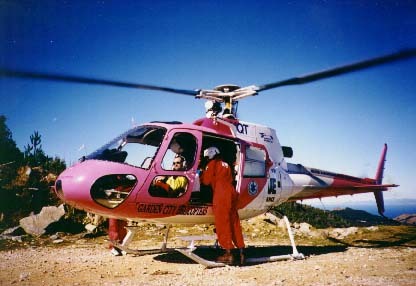 A big thank you for the crew of the rescue helicopter, and staff at Nelson and Wellington Hospitals. Also to Meindl boots (which did their job well). And finally, to Carl Koberstein for organising the Mousetrap classic, and for going up with a chainsaw and avenging me on the treestump (and other dangerous obstructions at take off). Long may the Riwaka take-off be safe!